Etymology: Shenzhou is the ancient name for china and Greek, sauros, ‘lizard’. Etymology: orientalis refers to the east. Locality: Sihetun, Shangyuan, near Beipiao City, Liaoning Province, China. Horizon: Horizon 1, Lower part of the Yixian Formation, Jehol Group. Biostratigraphy: Psittacosaurus Fauna, Confuciusornis Avifauna. Age: Valanginian Stage, Upper Neocomian Subepoch, Early Early Cretaceous Epoch, Early Cretaceous. 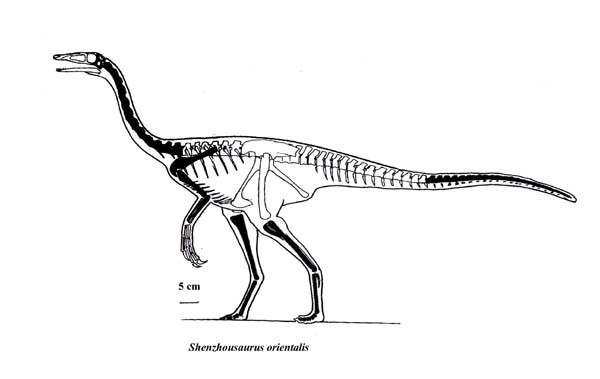 Material: Fragmentary skull and fragmentary skeleton lacking cervicals, first dorsals, most of the pectral girdle, lower legs and distal caudals.